With just a few words, Bob Dylan started a movement. At the end of the big 1985 Live Aid concert he said something like “It would be great if some of this money could help the farmers in this country.” Thus, Farm Aid was born. In September of that year, he appeared at the first Farm Aid concert with Tom Petty and the Heartbreakers as his backing band. 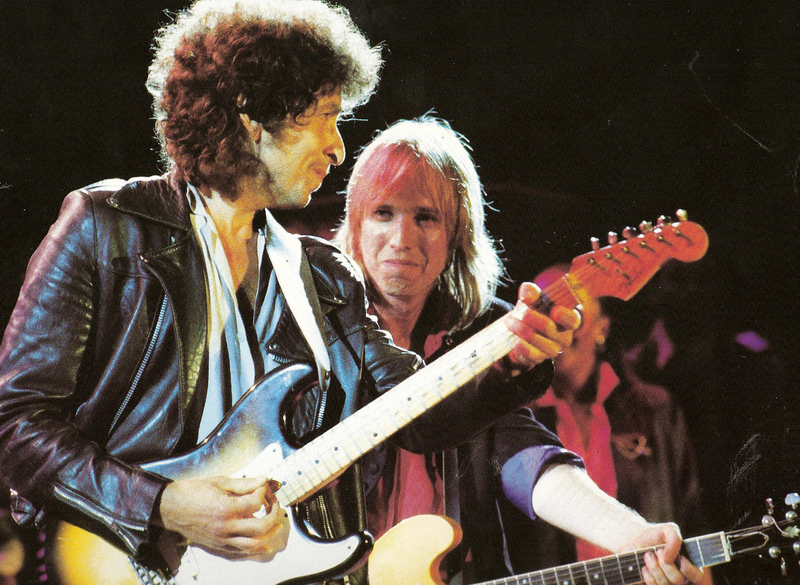 Dylan apparently liked the matchup so much that we went on tour with Petty. The next year he released Knocked Out Loaded, with the Heartbreakers playing behind him, and came up with an odd title song for a movie, Band Of The Hand. The “True Confessions” tour was a rockin’ experience and a kick in the pants for the careers of both performers. Two years later, Petty and Dylan would have a hit on their hands when the first album from the Traveling Wilburys scaled the charts. But that’s another story. This entry was posted on April 29, 2008 at 6:53 am and is filed under Rock Moment with tags Bob Dylan, Tom Petty. You can follow any responses to this entry through the RSS 2.0 feed. You can leave a response, or trackback from your own site.